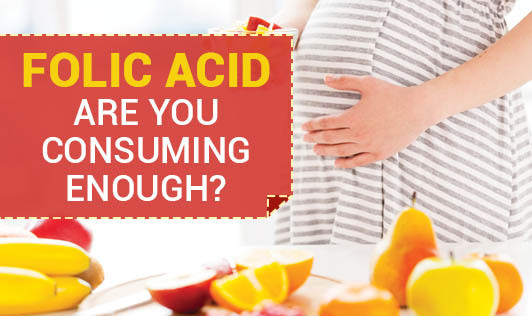 Folic Acid - Are you Consuming Enough? If you are planning to conceive, you really need to be careful about your own nutritional status! Certain vitamins and minerals are very much necessary for normal growth of the baby in your womb... Folic acid/folate is one of those! Folic acid deficiency can lead to neural tube defects like spina bifida. These defects occur in the early pregnancy most of the times. To prevent your baby from suffering, you need to plan ahead. Start taking folic acid supplements as soon as you think about conception. The requirement of this B vitamin is higher during the pre-pregnancy and the early few weeks after conception. In addition to taking folate supplements, make sure to include lots of green leafy vegetables, oranges, papaya and dairy products in your diet regularly. So, if you are planning to conceive, get a prescription for folic acid from your Gynaecologist or your Dietitian... Sign your baby's safety with it!